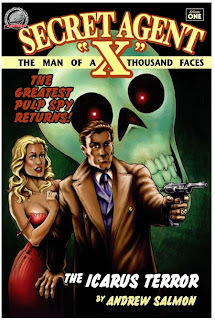 The good folks at iPulp have posted my Secret Agent X tale, THE ICARUS TERROR, for download to your cell phone or tablet! A rollicking X adventure for only $1!! The tale is iPulp's 500th tale. Pop the champagne! The story first appeared, and is still available in print, in Airship 27's Secret Agent X Volume One. But if you want the tale to carry around to read when you want, then it's yours for only $1. From the heart of Africa to the streets of Harlem, a new hero is born sworn to support and protect Americans of all races and creeds; he is Damballa and he strikes from the shadows. When the reigning black heavy weight boxing champion of the world agrees to defend his crown against a German fighter representing Hitler’s Nazis regime, the ring becomes the stage for a greater political contest. The Nazis’ agenda is to humble the American champion and prove the superiority of their pure-blood Aryan heritage. To achieve this end, they employ an unscrupulous scientist capable of transforming their warrior into a superhuman killing machine. Can the mysterious Damballa unravel their insidious plot before it is too late to save a brave and noble man? 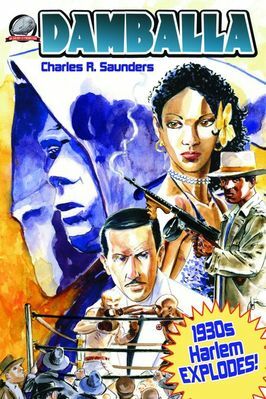 Airship 27 Productions and Cornerstone Book Publishers are proud to introduce pulpdom’s first ever 1930s African-American pulp hero as created by the acclaimed author, Charles Saunders. DAMBALLA by Charles Saunders features a cover by Charles Fetherolf and interior illustrations by Clayton Hinkle, with book design by award-winning artist Rob Davis. 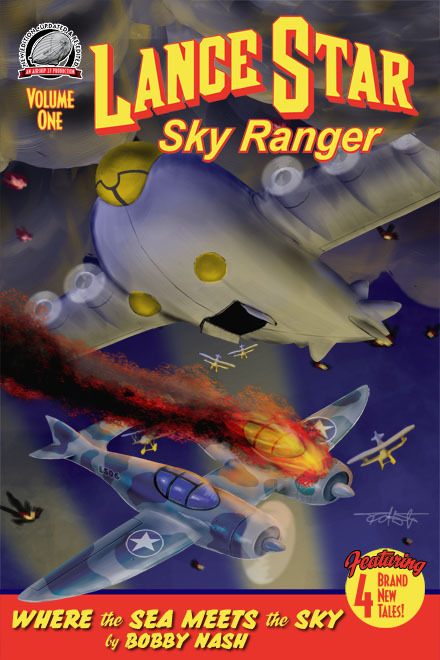 Flying high in the pages of the Airship 27 Productions anthologies and eBooks, Lance Star: Sky Ranger’s writers and creators have partnered with iPulp Fiction to bring exciting pulp stories directly to your mobile device. iPulp Fiction is releasing a story a day throughout June and July including tales featuring Lance Star: Sky Ranger. Bobby Nash’s story, “Where The Sea Meets The Sky” will be released July 18th for the low price of $1.00. Visit iPulp at http://www.ipulpfiction.com/ for more information. iPulpFiction is a cloud-based reading service that publishes classic and contemporary short stories that are accessible from any device with an up-to-date browser and an Internet connection. iPulp is on the cutting edge of a new generation of web apps. Beginning this week, look for new Lance Star: Sky Ranger based interviews with the writers, editors, and the crew at iPulp Fiction and airship 27 Productions at the official Lance Star website, http://www.lance-star.com/. Make sure you check out Bobby Nash’s Lance Star: Sky Ranger story, “Where The Sea Meets The Sky” on July 18, 2011 when it is released for the low price of $1.00 at www.ipulpfiction.com. Print and digital editions from Airship 27 are also available. For more information on Lance Star: Sky Ranger, please visit http://www.lance-star.com/ and http://www.bobbynash.com/. Announcing All-New Doc Savage Novels! BOSTON, MA—JUNE 14, 2011: Altus Press is excited to announce the launch of The Wild Adventures of Doc Savage, the first in a new series of blockbuster novels starring the legendary pulp superhero in nearly 20 years. Written by prolific pulp writer Will Murray, who has won acclaim for his unequalled ten-year tenure ghostwriting Warren Murphy and Richard Sapir’s Destroyer action-adventure series, The Wild Adventures of Doc Savage is a continuation of the well-received Doc novels Murray wrote for Bantam Books back in the 1990s, along with the late Lester Dent. The posthumous collaborations will be published under time-honored byline, Kenneth Robeson. 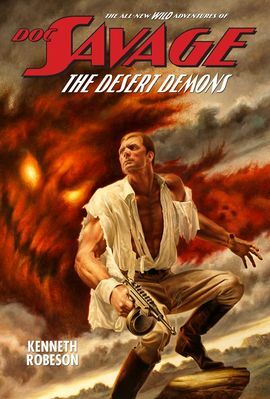 Fully authorized by Condé Nast, trademark holder of Doc Savage and based upon unpublished outlines and manuscripts originally written by Lester Dent, the originating writer of the seminal Street & Smith superman, and licensed from the Heirs of Norma Dent, The Wild Adventures of Doc Savage begins with a searing story set in the summer of 1936, The Desert Demons! “I’ve always had an uncanny knack of writing novels that are more topical when published than when I wrote them,” Murray revealed. “Witness Nick Fury; Agent of S.H.I.E.L.D: Empyre. Published in 2000, it reads like a blueprint for the September 11, 2001 terror attacks on New York City and Washington, D.C., right down to the use of passenger aircraft piloted by terrorists to decimate U.S. cities. Murray also reunites with his other Doc Savage collaborator, award-winning artist and sculptor Joe DeVito, who will paint the covers from never-seen photographs of model Steve Holland, who posed for the best-selling James Bama covers as the living embodiment of the Man of Bronze. These vintage photos were donated to the project by Mr. Bama. The Desert Demons will be released in July, followed by a second wild exploit, Horror In Gold, by late summer. Seven new novels are planned. Murray promises the familiar characters in their rightful time period, but with a definite edge to them. —6”x9” trade paperbacks which will be available to bookstores and comic shops everywhere, as well as to individual purchasers through the official Wild Adventures of Doc Savage website, www.adventuresinbronze.com. —6”x9”deluxe hardcovers which will contain an illustrated Afterword detailing the background creation of each novel, as well as bonus articles and biographies by Will Murray and others—available in this edition only. These will also include signed bookplates autographed by Will Murray, artist Joe DeVito, and “Lester Dent” (in facsimile). —e-book formats available for all the most popular e-readers: Amazon Kindle, Sony Reader, Barnes & Noble Nook, and Apple’s iBookstore (for the iPad and iPhone).